Women’s College Health Research (WCHR) is a charitable organization founded February 9, 1994. In that year, the building at 790 Bay was purchased from Orlando by WCHR with the goal to support future efforts in women’s health. WCHR is an independent corporation. The original WCHR Board members had an appreciation of the contributions of Women’s College Hospital in matters of women’s health. 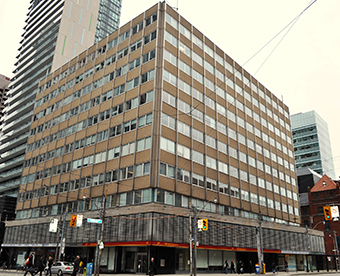 Peter Dickinson built the Continental Can Building at 790 Bay in 1959. He was the renowned modernist architect behind the Inn On The Park. Born in London, England in 1925, Dickinson arrived in Canada after World War II, soon making a reputation for himself that would resonate long past his tragic early death from cancer in 1961. As Canada’s most celebrated architect at the time, he is best known for the Hummingbird (née O’Keefe) Centre and Montreal’s CIBC tower, but many more of Dickinson’s legacies are prominent around Toronto. Early in 2006, there was a major shift in the building tenants which now has a medical services focus. Today, 790 Bay is one of the largest medical service buildings in Canada.